Gir National Park is the last remaining bastion of the Asiatic Lion. In the early 1900s due to rampant trophy hunting the population had dropped to only 15, which urged initiative assisted the population. Our beautiful Cottages are BANG ON THE FLOOR !!! 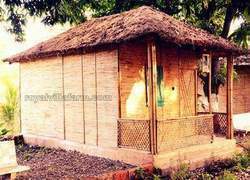 an exhilarating experience awaits you with these bamboo cottages that come with private balcony, double bed ,attached bathroom with hot water facility and various other amenities like wardrobe, dressing mirror..And what's more..they're absolutely nature friendly!A formidable ambination indeed, making them a highly popular choice. An open air restaurant that offers typical flavours of Gujarat, traditional delicious kathiyawadi dishes, finest food. Let's make your night extravagant watching folk dance of tribes( Dhamaal Dance ) and the Group Camp fire . Habsi Folk Dancers. follow very few of their original customs, with a few exceptions like the traditional Dhamal dance. 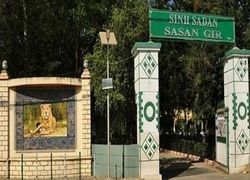 The sinh sadan sasan gir is situated nearby Gir Wildlife Sanctuary and it is famous for the Asiatic lions. Sinh Sadan Guesthouse lies on the way to main highway, well decorated with beautiful flowers and makes the gardens attractive. 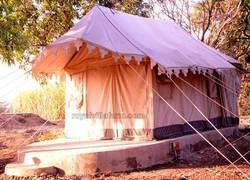 Housing and lodging in Sasan Gir is quite easy, realistic for the travelers who can take an advantage with efficient range of services. Restaurant of sinh sadan sasan gir provides a multi-cuisine restaurant which serves the delicious and delightful food. 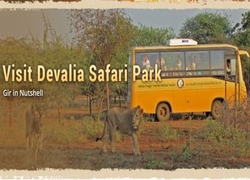 Devaliya Lion Safari Park is situated very close to Kanar in the state of Gujarat, India. It is one of the most fascinating and beautiful places of India and people from all across the world must visit it. Devaliya, The lion safari park is barely 12 km from Sasan-Gir, and is perhaps the only place where you can come across Asia 's largest number of lions. 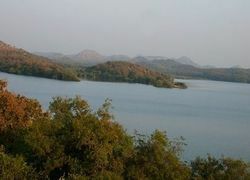 A water reservoir created by a dam on the river Hiran, Kamleshwar presents a panoramic view of Gir, hills and forest. The water body also harbours of a large population of crocodiles and is a good spot to observe water birds. 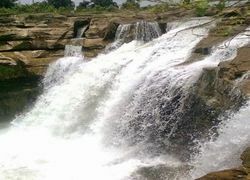 Jamjir water fall is situated near Jamwala village, which is just 30 Km from SasanGir. The waterfall is one of the most visited sites around. Our beautiful Cottages are BANG ON THE FLOOR !!! an exhilarating experience awaits you with these bamboo cottages that come with private balcony, double bed ,attached bathroom with hot water facility and various other amenities like wardrobe, dressing mirror. . And what's more.. they're absolutely nature friendly! A formidable ambination indeed, making them a highly popular choice.